Is purple the new cream? 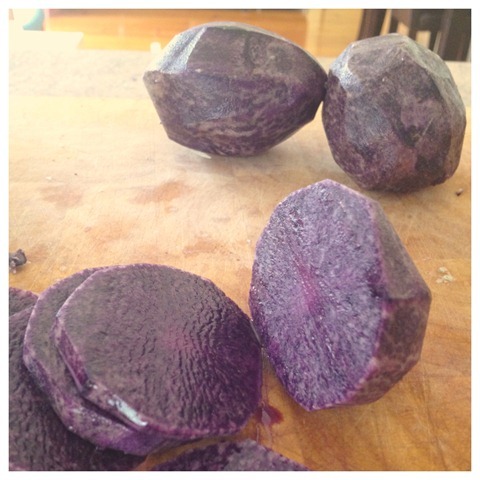 I purchased them thinking they would be cream once you peeled them, but nope, purple. A quick google confirmed that this was normal and they’d fade on cooking. While they faded a little, they were still very much purple when served up to our dinner guests. It reminded me of Bridget Jones and the blue soup. I confess I completely forgot to post yesterday. I’m a little annoyed with myself as I was so determined to actually complete Blogtoberfest this year! Oh well… onward we go! I had these for the first time recently too. Our dinner guests were very unsure of my purple mash and it took some explaining. I think missing only one day so far and looking after a busy toddler is admirable… I’m lucky to remember to brush my hair most days so blogging daily would be beyond me!